I can’t tell you how many times I’ve read that people are getting these three products confused. ArcGIS Explorer is ESRI’s ArcGIS Server desktop client. 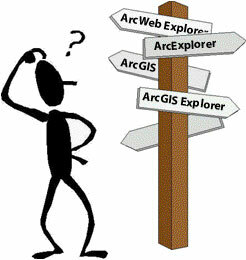 ArcExplorer is ESRI’s GIS viewer (either MapObjects or Java based) and ArcWeb Explorer is ESRI’s flash based ArcWeb browser client. About the only things that they have in common are that they are free and they are made by ESRI. ESRI’s propensity to name things with the prefix “Arc” causes some of this confusion, but having two products with the prefix Arc and Explorer in their name could be worse. ArcWeb seems to be included in ArcGIS as well as on its own. ArcGIS extensions usually have ArcGIS in front of their names (e.g. ArcGIS 3D Analyst or ArcGIS Publisher), but Maplex for ArcGIS and ArcScan for ArcGIS both append ArcGIS to the end. It is even worse on the server side as only ArcGIS Server adheres to the ArcGIS naming convention. ArcIMS and ArcSDE (both which predate ArcGIS) continue to hold on to their older names and ESRI Image Server doesn’t even have the word Arc in it. ESRI Developer Network which is really ArcGIS Server and Engine Developer Network also doesn’t use Arc. One could go one, but I think everyone gets the picture. The bigger problem as I see it is that ESRI still isn’t getting any better at naming (taking ArcGIS Explorer and ArcWeb Explorer as the example). It is hard enough to explain the difference between ArcGIS Desktop, ArcView, ArcEditor and ArcInfo these days without new products making it worse. I guess eventually there will be two products, ArcGIS Desktop and ArcGIS Server and the licenses will dictate how they are to be used. Still ESRI doesn’t seem to like to give up on these old names so I’m sure we’ll see ArcIMS and ArcSDE soldier for years to come.